Why not discover somewhere new, unthought of before? Travel with us through Ireland with EngSoc. Ireland is rich in its history and draws in vast volumes of tourists hoping to gain a taste of the culture it is so proud of. Kilkenny castle has been a testament to the island’s history and identity since 1195 when it was originally constructed. 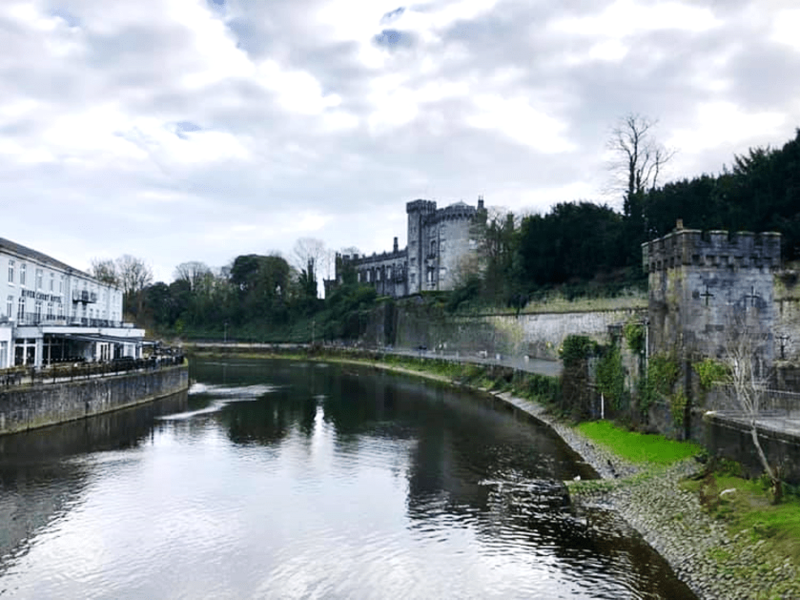 About 80 miles south of Dublin, the medieval town of Kilkenny is a quaint spot with strong roots in religion, dating as far back as the ninth-century. Its churches, towers, cathedrals and of course the castle are open to visitors and make for a very enlightening tour around East Ireland. At night the castle is a spooky spectacle; lit up in a green hue while the rest of the town sleeps in darkness. Between February and October guests are able to explore the castle’s grand rooms freely, but in the Winter months of November to January, a friendly tour-guide hosts each visitor. These tours last around 45 minutes and enhance the castle’s story by bringing its history to life. Beginning in the basement, the tour depicts the castle’s foundations from the early thirteenth-century before it was redesigned as a home, inhabited by the Butler family for some 600 years. The dramatic building is a bricolage of different architectural styles and eras, merging medieval structure with Victorian taste and modern replications of furniture and wallpaper. Each room is a busy reconstruction of how it was once utilised by the Butler family, and the restorative work the castle has undergone is impressive – truly immersing you within a piece of Irish history. Even the archaic kitchen has been restored and is now the tea room, although the huge black stoves are purely decorational! One of the most impressive rooms is a huge gallery, exhibiting portraits of the castle’s many occupants throughout its life. Even the ceiling boasts of detailed paintings – each wooden beam is adorned with a female figure (with the exception of one which hosts the artist’s young son) and the bronze head of an animal or mythical creature at the end. There is so much to take in. Outside sits fifty acres of a gorgeous green garden visitors are free to roam, overlooking the historic town. From outside the castle grounds, the Butler’s residence dominates the landscape. Not only because Kilkenny’s shops, pubs, houses and more pubs sit very low to the ground. There is a fairy-tale-like quality to the town as though time itself has forgotten about the sleepy village. Everyone is wonderfully friendly and there is a strong sense of community – although that’s not exclusive to Kilkenny! If you’re not so much of a historian, Dublin city centre and the surrounding area is equally ripe with culture. Even the main city centre is intriguing, with its complicated architecture and ancient pebbled roads, giving way to the modernity of tram-lines. Many of Ireland’s spots are a captivating clash of old and new, natural and constructed. If you want to experience Ireland’s sights yourself, Sussex English Society is hosting a short trip in April, including the opportunity to explore the Guinness factory. The two-day excursion to the birthplace of renowned authors like Oscar Wilde and Bram Stoker is set to be a fun Easter getaway from the 5 – 7 April. Flights and accommodation cost only £154 when booked through with a special code. Absolutely anyone is welcome but the deadline is soon. For more information contact ‘Sussex EngSoc’ on Facebook. Get your boots on and discover something new!